Once upon a time, auto lettering was done by an artist with a paint brush. Also known as automobile lettering, car lettering, or truck lettering, we now use the same cut vinyl technology that we use to letter store windows, and there are still artists involved today. Vinyl is an inexpensive polymer that is easy to color, easy to apply, and is resistant to degradation by weather and UV light. Using a vinyl plotter driven by a digital design file, we cut letters in hundreds of font styles from sheets of adhesive-backed vinyl. In the same way, we can cut out your digitized logo. The traditional color for window lettering is white, which is easy to see on glass, and easy to see against the relatively dark interior of a car. Lettering and logos for auto bodies can be cut from whatever color looks good and stands out against the paint. We stock dozens of colors, including silver and gold. Sometimes the design of a logo, or lettering involves combinations or gradations of color, such as rainbow effects or birefringence patterns. Using the same wide-format printer technology we use for auto wraps, we can print multi-color lettering, logos, or designs. 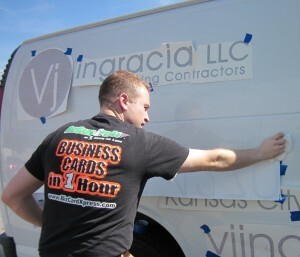 We offer professional vinyl installation in almost any weather, winter or summer. 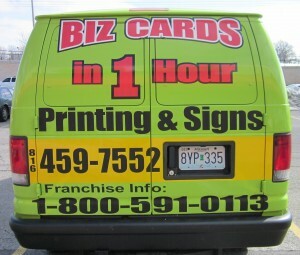 We also remove vinyl lettering if your information should change. 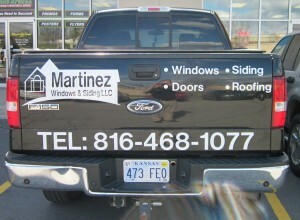 Contact Streamline Print & Design at 816-459-7552 in Kansas City, MO to consult with us about your next window lettering project.